The loop stitch is an easy one, but on first glance appears quite fiddly. I thought it might be useful to make a tutorial to help you work through the stitch, so that you can go ahead and make your very own Sheldon the Sheep! I have made both a video and photo tutorial, as I know I usually have to see both to really understand what goes where! The first thing to note in the Sheldon pattern is that when working the head and body, I suggest to work in the back loop only. Why? I'm not sure really, it's just the way I've always done it! 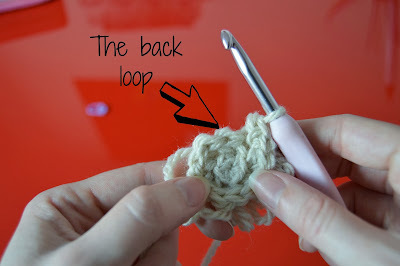 Step 1: Put your crochet hook through the back loop of the next stitch, and then yarn over. Step 2: Next, stick out your index finger that is feeding the yarn. This makes the 'loop' of the loop stitch. Step 3: Can you see the yarn hanging between my index and middle finger? Catch it with your crochet hook. Step 4: Pull it through the first loop on the hook. You should then have 3 loop on your hook. Step 5: Yarn over again. Step 6: Pull the yarn through all three stitches. And your done! The loop will show on the back of the piece you are working on. I can imagine a loopy cushion cover using this technique too. Ooooh it would be yarn-hungry but it would be amazing! Hello Leah, I have commented elsewhere but JIC (just in case) here I go ahead. I am having a problem with Rounds 4 and 5 of the face and possible 9 and 10. I'm excitedly making my second colourful Sheldon and I can't find the loop stitch video. It seems to be invalid now. Is there any chance you have the video stored somewhere because I'm a little bit confused and can't remember how I did it last time. Best explanation on the loopy stitch, anywhere! Somehow, understanding what happens in that magic loop evades me. 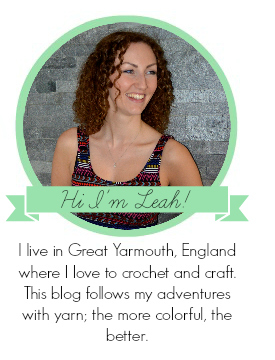 Are there single crochet stitches? If so, how many. It is hard for a new crocheter to understand. It is well explained how to make the magic ring, but the next step must be adifference in the UK and US versions. https://www.youtube.com/watch?v=iuR0OlDqH0g This is the tutorial of making the loop stitch.